Our favourite things is an exploration of the collection of Strutt’s North Mill. Each of the objects featured here have been picked by our museum volunteers as being something that they think is a hidden gem from the museum’s collection. These objects all have links with Belper’s past. Some are very simple things with a surprising past, others are better known, yet each has its own story to tell. New objects will be added here every month. Some will also feature in a display in the museum for a limited time. A length of pipe rescued from a spoil heap in the 1960s reveals how the Strutt family lit their mills as North Mill volunteer Gordon explores his favourite object. 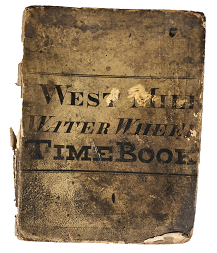 The book used to record the operating hours of the Waterwheels of Belper’s former West Mill reveals its secrets. Belper North Mill Trust Secretary Rosemary Annable explores why this is her favourite object.